What is the first thing that comes to mind when you hear the term “flagship” loudspeaker? Its size, of course. Such speakers tend to be impressive, full-range statements—multi-driver platforms that cast long shadows in the room, their sheer size cowing listeners into respectful, worshipful silence. But grandiosity alone doesn’t make the argument all by itself. So the question I’ve been asking myself ever since I began listening to the B&W 805 D3 is: Can a two-way compact, a segment defined by modesty and yes, limitations, be considered a flagship product? Hold that thought. 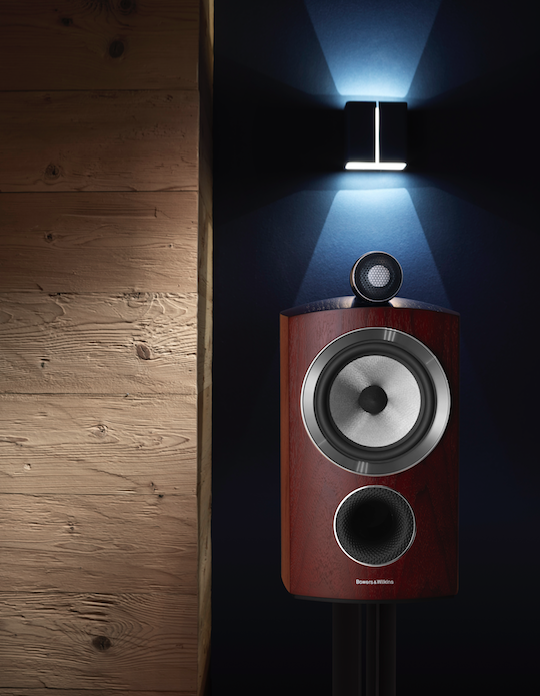 The 805 D3 represents the sole compact in Bowers & Wilkins’ new lineup known as the 800 D3 Series. By new, I’m not suggesting a mere a tweak here or a twist there. The engineers at B&W implemented a top-down reboot of the venerable series, and in some instances virtually every part, screw, and bolt was replaced. The overhaul was so comprehensive it even prompted a factory renovation to the tune of several million dollars (see my B&W factory tour report, Issue 257). The 800 D3 series comprises seven models: four floorstanders, a single stand-mount, and a pair of home-theater center-channel speakers. In the 805 D3, B&W retained the rigid enclosure of its predecessor while refreshing some of the trim and accents in accordance with its new transducers’ requirements. Also retained is the distinctive FlowPort with its golf-ball-like dimpling that B&W developed to minimize port turbulence. Visually, it’s a gorgeous piece of industrial design—all sweeping curves and no parallel surfaces. And compared with the cool tech-chic of a CNC aluminum enclosure, the 805’s smoother organic lines and traditional wood finishes are softer on the eye. Personally, I like high-end gear that I can warm up to just a little bit. The B&W team also concentrated commensurate efforts on the drivers. The model 805 was already renowned as the only stand-mounted compact with a diamond tweeter, but now its outboard housing, formerly cast of zinc, is a single aluminum billet. This creates what is essentially a massive heatsink for the diamond tweeter motor, and its design is much more inert which reduces ringing. The most obvious visual difference is the 6.5" mid/bass driver. B&W retired its yellow Kevlar midrange cone material, a B&W mainstay since 1974. The reason? While B&W’s front office insists that Kevlar remains a good performer and measures well in terms of motion and breakup, the engineers wanted to take advantage of today’s more advanced computer-modeling techniques and testing. The result is the Continuum cone. In development for some eight years and seventy iterations, the (still patent-pending) technology is a woven composite material based on the concept of optimized and controlled breakup. The material markedly improves upon Kevlar by providing ultra-quick settling time and therefore no ringing. Sonically the 805 is a fiercely confident and bold performer. Its character is quite neutral with hints of lower mid/bass warmth, yet it’s open, presenting uncluttered imaging. B&W has long been a creature of the recording studio and in true studio-monitor fashion, you can thrash the 805 D3s with heaping gobs of volume (recommended power is 50–120Wpc) and they never lose their composure, constrict, or harden. Short of putting your ears at risk, virtually nothing fazes the 805. Its midrange signature was a near-seamless combination of speed, wideband dynamic contrast, and dense tonal color. Vocals exhibited a slightly forward emphasis, a trait consistent with B&W’s experience in the pro-studio-monitor world, yet the 805 was not an aggressive “in-your-face” loudspeaker either. And it won’t pretty up a lackluster recording; it will expose it. Its upper bass and lower mids were surprisingly vital for the small cabinet volume, and this gave the dueling cello and acoustic bass from Appalachian Journey a nicely defined and richly realized resonant structure and a strong impression of air movement that is often AWOL in small compacts. However, for the final deep and sustained growl of acoustic bass under Edgar Meyer’s bow you’ll still need a fast subwoofer. Readers might be wondering whether my own listening room results comported with the impressions I got at B&W’s SRE (Steyning Research Establishment), where I was given the opportunity to listen to the 805 D3 next to its predecessor, the Kevlar-driver 805 D. To reiterate, I found that they had some sonic similarities, but the D3 version was cleaner, smoother, and a more confidently defined and open performer. The D3 also had more dynamic snap, and soundstaging was far better realized, thus creating a more detailed sense of space and dimension. If anything, the gulf between the new 805 and the old version turned out to be even wider in my own listening room.